Union Road Transport and Highways Minister Oscar Fernandes today said that full efforts will be made to get the Motor Vehicle Act (MVA) Amendment bill passed in the coming Parliament session as it was already cleared by the Rajya Sabha. Enforcement of comprehensive and clear legislation with appropriate penalties, accompanied by public awareness of the laws is a critical factor in reducing road traffic injuries and deaths. “Once the proposed amendment is passed, traffic rule violators will have to cough up hefty penalties – almost 10 times more than what they pay now – for offences such as over speeding and drunken driving. The Bill seeks to raise compensation for death resulting from a hit and run accident to Rs one lakh and Rs 50,000 for the injured in such incidents.” Said Mr Fernandes. During the concluding session the Minister launched a new Logo on Road Safety, with an aim to encourage every section of society to join hands towards making roads safer. The theme of this year’s Road Safety awareness is “When on road, always say Pehle Aap” . He also gave away His ministry’s Trophy’s to State Transport Undertakings. 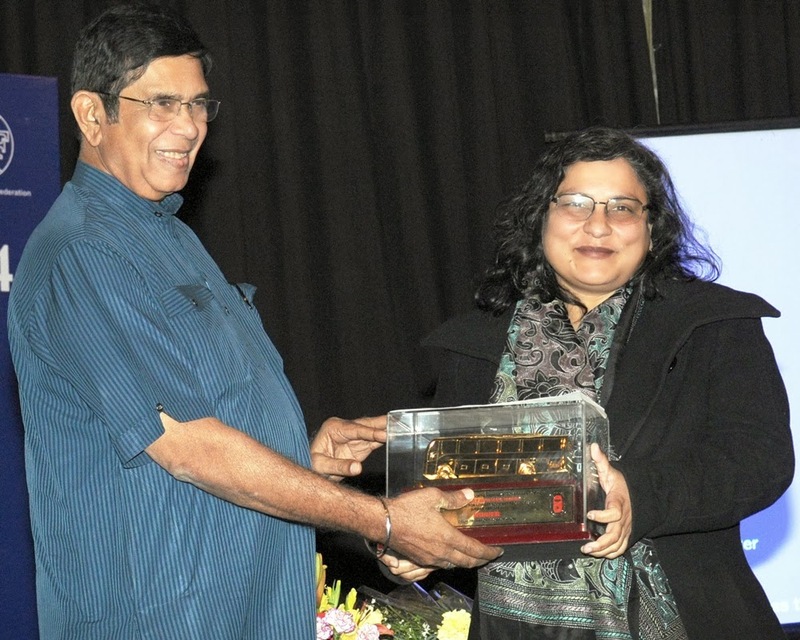 Delhi Transport Corporation (DTC) bagged the trophy for Road Safety for Urban Services. The other states included Haryana, Sikkim, Andhra Pradesh, Andaman & Nicobar and Rajasthan. Mr Vijay Chhibber, Secretary, MoRTH speaking on the occasion said “Ministry of Road Transport has written to Department of Industrial Policy and Promotion (DIPP) to make retro reflective tapes on bicycles mandatory, so that all manufacturers use these tapes. Delhi Traffic Police along with International Road Federation (IRF) is already providing free reflective tapes for about 10 lakh bicycles. This project will soon be taken to other metro’s including Bangalore & Trivandrum”. “Getting encouraged from introduction e-Challan system in Delhi and adoption of technology by out policemen , we have planned to lunch ITMS in in capital. This will help in increasing our challans as there are currently 10,000 traffic violations per day. Actual violations are about 50,000 per day. With adoption of new technology the challan revenue generated is expected to go up to Rs 800 to Rs 1000 crore from the current Rs 50 crore per annum.” Said Mr Hassan. “This will also help in optimization of traffic lights to about 99.9 per cent with very less fault and the Police personal will be able to regulate more traffic instead of enforcing it. Delhi Traffic police has 6000 personal highest in the country and most of the time by them is spent in enforcing traffic laws rather than controlling traffic” said Mr Hasssan. Mr K.K.Kapila, Chairman, IRF Speaking on the occasion said India accounts for 10 % of the global road accident fatalities. Several measures towards improving road safety including improvements in roads from engineering perspective, road safety audits at all stages of road construction beginning right from the planning stage besides identification and remedy of black spots which account for almost 90% of road fatalities in India.”. “IRF is dedicated to making roads safer refusing to accept the loss of life and limbs as the cost of mobility. It will continue with the efforts to reduce road accident fatalities through engaging larger communities and stakeholders in various awareness activities on road safety to encourage everyone to join hands in making roads safer.”said Mr Kapila.